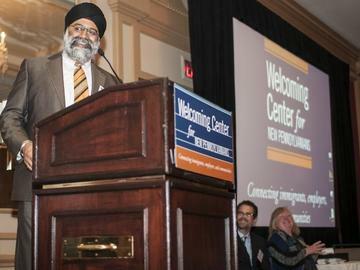 Since 2003, the Welcoming Center for New Pennsylvanians has connected more than 14,000 individuals from 140 countries with economic opportunities. Our mission is to accelerate immigrant integration and economic advancement through education, training, employment and entrepreneurship. We invite you to celebrate with us at the 2016 Solas. The Solas Awards are a hallmark of our organization and the primary fundraising event to recognize key community organizations and business leaders for their work supporting immigrant communities. At the event, you will meet a remarkable array of business, civic and community leaders who –like you- are tapping into diverse talent to enhance their ability to compete in today’s economy. It is a terrific opportunity to demonstrate support for Philadelphia’s growing global population. Mayor Jim Kenney will be given the Dennis Clark Solas Award for his ongoing commitment to the Welcoming Center and to immigrant issues throughout the City of Philadelphia. Tim Haahs, a Korean immigrant and the President & CEO of Timothy Haahs & Associates, a professional engineering firm he founded in 1994, will be given the Realizing the American Dream Award. Dan Hilferty and Independence Blue Cross will be given the Atlas Award for Creating Opportunity for their support of the Welcoming Center, and for building a strong and diverse workplace by recruiting and retaining international talent, and providing opportunities to hardworking individuals of all backgrounds, including immigrants. For more information, please contact Rebecca Rathje at 215.557.2858 or rebecca@welcomingcenter.org.